As we were visiting family over the July 4th holiday, we stopped at Chipotle Mexican Grill for a quick and tasty meal. We noticed they are giving away FREE KID’S MEALS on Sundays between July 11th and August 1st (inclusive). Just visit any Harrisburg, Baltimore, York, or Philadelphia Chipotle and receive ONE FREE KID’S MEAL with the purchase of a burrito, bowl, salad or order of tacos. Our son is 1 and loves to share a chicken bowl with us at Chipotle. This will be a great way for him to try his own Chipotle creation. 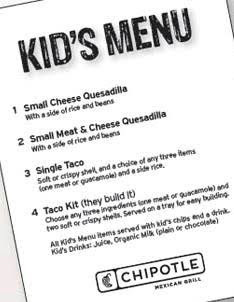 I bet he will love the Taco Kit (they build it)…fun! As always, check with your local Chipotle to verify they are participating in this offer.